A balanced yogic body begins with well executed movements performed with great ease and care. But what is “balanced”? Many yogis are unaware of the normal range and function of critical junctures of the body, particularly the shoulders. In the practice of yoga, every asana (posture) integrates upper extremity motion. Any misalignment of the shoulder creates imbalance. A repeated misalignment elevates the risk for injury and degenerative changes to the joints. 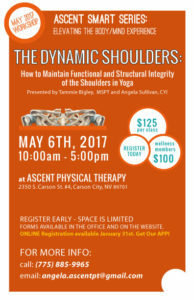 The purpose of this workshop is to highlight what represents normal mechanics of the shoulders and its application to a yoga practice. How to truly practice ahimsa (non-harming) and injury-proof your practice. Understanding basic anatomy and biomechanics of the shoulder and surrounding area. Defining normal range of motion for the shoulder and recognizing symptoms of shoulder ABUSE! Application of sound mechanics in asanas to prevent shoulder girdle injuries.